Fruit trees offer the benefit of beautiful flowers in the spring, followed by the gift of tasty edibles in the harvest seasons. 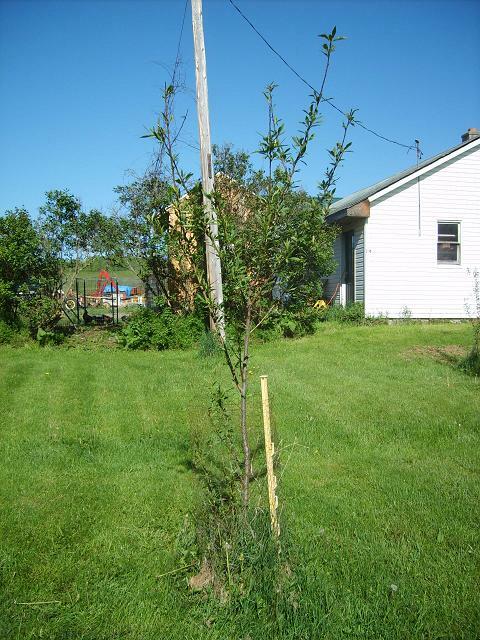 I am fortunate enough to have plenty of space for any multiple full-size fruit trees of my choice. Some newer types, grafted on dwarfing rootstocks, offer more manageably sized choices for those with smaller spaces. Either way, you can prune and train to manage a tree’s size. I have grown up with a number of large fruit trees on the property, but I’ve always wanted more, and just this year I have started to buy up and plant a bunch of ready-to-go ones. There is the cost of the investment to consider. You can get trees bare-root or containerized/potted. Bare-root tend to be significantly cheaper, but they need to be planted quickly, or put into temporary dirt/’heeled in’ until they can be. Potted plants have dirt around them already, and often have had a chance to grow some extra roots into that dirt. This can lessen transplant shock, but it can also be bad if the roots have overgrown and circled the pot. You’ll need to loosen them up before planting. Either choice can be good, though. What I do recommend most is buying local, if you can. Many areas have decent nurseries that offer potted or bare-root stock. Even if you’re left with the option of buying from a big-box store, I find it preferable to be able to inspect the plants and select the healthiest or best looking specimens. When you mail-order, you can’t be sure of what you’re getting, and sometimes the quality and size varies wildly. Another choice would be to plant your own trees, starting from seed/pit. Yes, it can be done, and it’s easier than some people would have you believe. The apple trees littering the scrubby areas of my property, spread there by wildlife, are evidence enough. The cost of this venture is pretty low, since you can do it with almost any moderately good dirt or potting soil, and you can use seed out of fruit you bought for eating. A word of caution on that, though – worldwide shipping has made it so that we can ignore the seasons and restrictions of our areas. Ensure that the variety you choose does well in your climate zone, or leaving it outside in a hot summer or harsh winter may kill it. One way to do this is to use the pits/seeds from fruit you obtain at a u-pick or farm market near you. With fruits like apples, pears, and cherries especially, the seedling will not be exactly like the parents. This is due to cross-pollination. 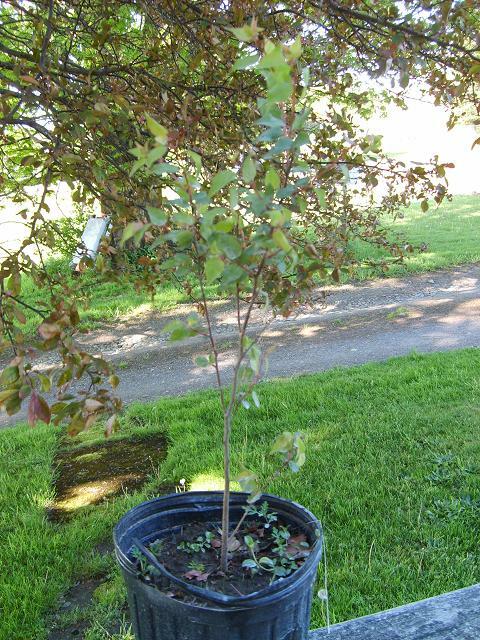 ‘Named’ varieties of tree bought from a nursery are created from propagating branches or shoots from existing trees of that variety, not from a seed. These ‘scions’, grafted onto new roots, are of the same genetic stock as the original. A seed contains new genes. The new fruit you get could be sour, small, or hard… or it could be bigger, sweeter, or juicier. It could be similar to the parent. You don’t really know until the tree fruits and you sample it. Of the wild apples that grew on my land, it seems that about half are sweet and half are sour. Of the sweet, some are juicy and amazing and some are bland. Of the sour, most are edible, but a rare one is very astringent and will dry your mouth right out. Some of the sour ones are great for cooking use, though, especially after a frost, and the animals like them regardless of taste… so don’t discount them. Peaches/nectarines are said to be a bit forgiving, and tend to produce fruit of reasonable eating quality, so partly for that reason I started with them. I have four seedlings from my ‘mother’ peach tree now, and I am hoping that they are anything like their parent. I’ve never found another peach like it. It’s been there for decades, un-pruned and un-sprayed, yet still gives many of the most juicy, melting, exploding-with-flavor white peaches. It will also take several years for you to get fruit from such a tree. Seedling fruit trees are vigorous, and can grow a lot in one year, but it still takes a while for them to get enough size for fruiting to occur. Are you patient enough to wait, knowing that there is a chance for disappointment, or would you rather buy a large, known-variety tree that might fruit within 1-2 years? The choice is yours. Personally, I have enjoyed growing the tree almost as much. If they give decent fruit, then even better. You start with a seed, of course. Some fruits tend to give up their seeds easily, such as apples, whereas clingstone peaches or plums leave considerable fiber attached to the pit. If the seed is clean, it’s good to go. If there is clinging ‘stuff’, scrub it off gently, rinse, and let dry for a short time. I recommend that you do not try to take off or scratch up the seed coatings or shells, especially if you’re a beginner. It is not necessary, and you might cause damage. Seedlings can and will push their way out when it’s time. Now, you have another choice. All of the fruits I have mentioned so far need ‘cold stratification’, a number of hours below 40 degrees before they can break dormancy and grow. Normally, this happens outside in temperate zones in the winter. You can pot the seeds up or plant them directly, leave them outside over a winter, and wait to see what happens in the spring. Sometimes they take 2 seasons, so leaving them alone is advisable if none grew for the first year. Or, if you’d rather start immediately, you can simulate winter in the refrigerator. Place seeds in a resealable plastic bag in potting mix or vermiculite. Sometimes placing between moist paper towels will work, or you can even pot them in small pots, though they still should go inside the bag to maintain moisture. Stick them in the fridge and wait. Don’t over-water – it should be slightly damp, not wet, or it can mold. The chilling time needed depends on species, but 2-3 months is usually adequate. Some may sprout inside the fridge, so check occasionally to remove and plant these. Otherwise, after you’ve given them plenty of time to ‘cool off’, place the seeds where you want them to grow. I prefer to put the seeds into pots instead of directly into the ground, because it lets me care for the young trees more closely and easily for the first period of its life. You can put them in the ground if you like, but the seedling will be vulnerable at first, because it is small and tender. If doing this, you will definitely want to keep weeds down and protect the little thing. 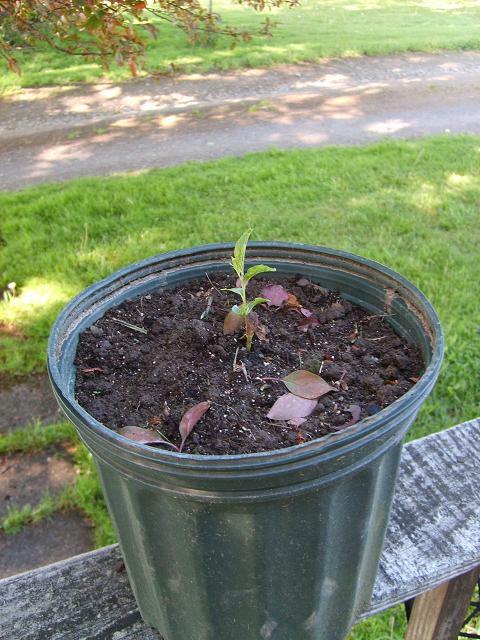 If potting, a good 1-3 gallon size pot/bucket is fine for a tree for 1-2 years, and then it needs to be either planted or moved up to a larger pot. 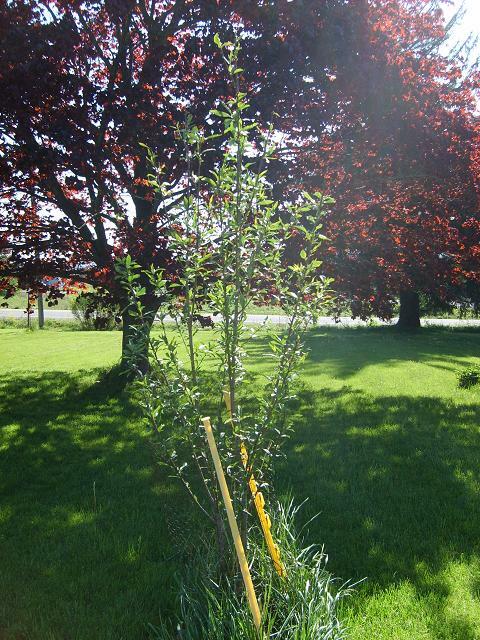 At 2 years of age, my peaches were around 3 feet tall and I moved them into the ground. Deer are extremely numerous here, though, and will browse plants to nothing if allowed to do so. To prevent this from happening to my baby trees, I surround them with chicken wire or welded garden wire fencing. The fencing doesn’t seem to need to cover the whole tree vertically (I only use 3-4′ fencing), although it should be a large enough piece that it goes around it width-wise without mangling branches. Deer seem to pass by after this, even if they could technically reach some of the branches above. I don’t know why, but it seriously helps. My seedling American Plums are a year older than my peaches, but are still under 4 feet tall because of heavy deer browsing. Tallest of my seedling peaches, entering its 4th year. The fencing in the photo is 3 feet. Now my young peaches are entering their 4th season and are getting big, and I estimate that they will produce fruit in another year or two. Only time will tell for sure, but I eagerly await them, even if they are not the same as their mom. Next up? Apricots. These little guys are a bit over a foot tall going into their second year, and I have some others that are just coming up.